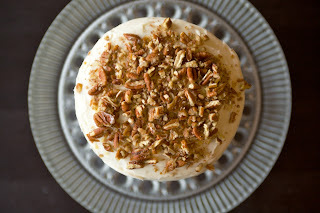 My mom, her best friend Liz, and my aunt Sandi came up to visit Seattle/drink/eat a couple weekends ago and to celebrate Sandi's birthday as well as the arrival of Fall, I made a pumpkin spice cake with maple cream cheese frosting. Since there were only 5 of us celebrating, I made a small cake. A two layer, 6 inch cake. I actually really enjoy making tiny cakes. They are some how more impressive when they're small. Kind of like when you go shoe shopping and the size 6 is always cuter than the size 9 you require. Plus, when a small cake is more practical, why not? You can simply cut the recipe in half or, like I did, just make thicker layers but of a smaller diameter. Taller cakes, no matter the size always stand out more. The recipe was simple and delicious. A standard pumpkin spice cake, similar to a pumpkin pie. Here is the recipe. The maple cream cheese frosting was a nice touch as well and added a hint of an extra flavor that usually isn't involved (maple). 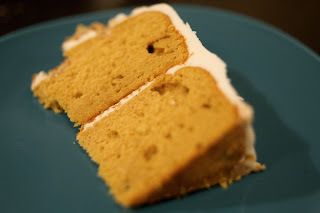 The maple really stood out and tasted great with the pumpkin cake. A fun way of changing up the usual pumpkin recipe. I have also made this recipe into cupcakes and mini cupcakes and they are fantastic. Just make sure to not over bake them. This cake is best when it is really moist and soft. 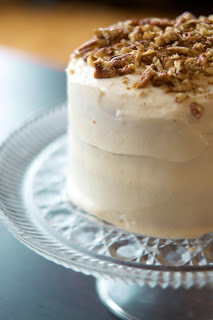 To add a bit of decoration, I added some toasted, chopped pecans to the top. Normally, I detest nuts in desserts but the cake seemed to be made for them. Couldn't deny it that simple pleasure. This is a beautiful cake, and so perfect for Fall! Thanks Cate! Just checked out your blog and you food looks amazing! Will definitely have to try to make some of it! Looks delicious!! I bet the maple cream cheese frosting was amazing! Thanks Taylor, you know, it is quite good! Beautiful! I'd love to include this in the October Layer Cake edition of Sugar High Friday's. See http://zuccherodolce.blogspot.com/2010/10/sugar-high-friday-octobers-theme-is.html for more info. H Allie, Thanks so much!! I'll email you my info!